The group comprises a celadon and russet recumbent horse; a recumbent horse nuzzling its folded hind legs, the stone of a celadon and mottled tone; a seated dog, the stone of an even white tone. The fourth is carved as a clambering feline on a fan, the stone is of a grey and russet tone. 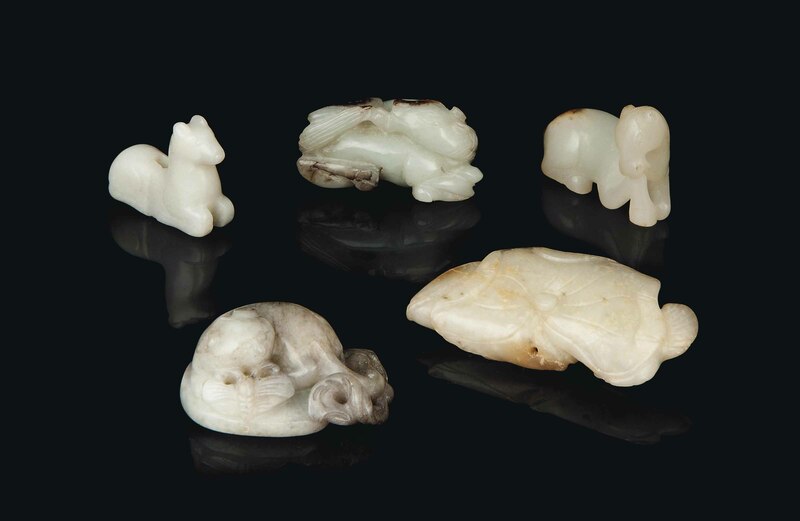 The fifth is a celadon jade carving of a fish on a lotus leaf. From a Private East Asian Collector (d.1994). The first, acquired in June 1985 in Hong Kong.